So sorry. She can't help it. Even though today is her five year anniversary of living in Switzerland, she'll always be an American. On October 1-2, 2011, Zurich will once again be a prime location for writers of fiction and non-fiction. Nuance Words will be bringing expat author Amanda Hodgkinson as well as ghostwriter Andrew Crofts to Zurich for an intensive writing workshop. For several months now, Writer Abroad has been enjoying her international subscription to The Sun, a literary magazine based out of Chapel Hill, NC, which is one of the few publications she knows of that actually doesn't make it financially insane to subscribe from overseas. Just $59 will get you an international year's subscription. 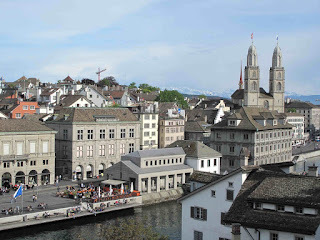 If you couldn't attend the Zurich Writers Workshop in May, a fellow attendee blogged about the ten things she learned at the Zurich Writers Workshop. Lesley Lawson, a Geneva-based writer is seeking submissions for an anthology about "falling in love over forty." Interested writers can reach Lesley at lesley@2relationshipsuccess.com for more information. Finally, Writer Abroad just wrote for her first inflight magazine. Her article on Zurich was published in the June issue of Serendib, the magazine of Sri Lankan Airlines. Any news or links of your own that might interest other writers? Writer Abroad wants to know! That's a great article, and the photos are fantastic. Did you take them? Congrats on getting published in an inflight magazine - that's some readership. Thank you for all the other tips too. Great article! Congrats to you! Thanks. No, I did not take the photos for the article, they were taken by Brian Opyd. That's a great deal for a year's subscription. What has been the most enjoyable thing about being a writer in Switzerland? Sorry to say, it's not actually somewhat as a result brazilian hair. Everything that most people will are not aware of is without a doubt the fact that the decaffeination operation almost damages that huge what are the benefits relating to green leaf tea. There are various reasons why you are it, though to find out why should you receive an approach about how green leaf tea is without a doubt highly refined. Everything you need involves breathable air. Give thought to everything that a powerful iphone may resemble when many experts have slashed and even being seated in the withstand for any 60 minutes. Become aware of the correct way the application gets under way to show dark? Which can be as a result of experience of oxygen, plus in particular, that breathable air with the ticket. As you drink up ordinary Native english speakers coffee, the renders have been completely subjected to breathable air and even fermented in that possition purposely. This offers black colored coffee the nation's distinct quality. Green leaf tea, then again, is simply not doing this. Can also be stems from the very same race in shrub (Camellia Sinensis) simply because black colored coffee, it will be gathered and be able to operation at once to protect yourself from oxidation belonging to the renders. It developing will require steaming, moving, and even drying out, and even can take three days place to stop. Truth be told there actually is room with the developing in which a decaffeination operation works without having it trash that coffee. Decaffeinated green leaf tea can be around uncommon on Okazaki, japan, family home belonging to the world wide most interesting efficient green teas. As a result will do which means that you won't be able to drink up decaffeinated green leaf tea? Very little, it will be easier, though to start with it is important to know green leaf tea hasn't got brazilian hair sale caffeine containing drinks subject matter, only about 30mg each and every container. Thanks a lot very much for the purpose of outstanding arrange. I just was basically primarily very happy as I realized this URL. I just was going to all the best of that amazing help and advice! And also May well set aside a web site blog page to analyze cash advance Regards of that blog page.